British Journal of Neuroscience Nursing is the only journal in the UK dedicated specifically to neuroscience nursing. The journal publishes articles on all aspects of clinical practice in neuroscience nursing including neurosurgery and critical care, and long-term neurological conditions. It addresses both paediatric and adult care, and endorses inter-professional working with members of the multidisciplinary team. British Journal of Neuroscience Nursing is the official journal of the British Association of Neuroscience Nurses and works in partnership with BANN to promote the educational and professional interests of neuroscience nurses in the UK. The journal is endorsed by the Neuroscience Nursing Benchmarking Group. 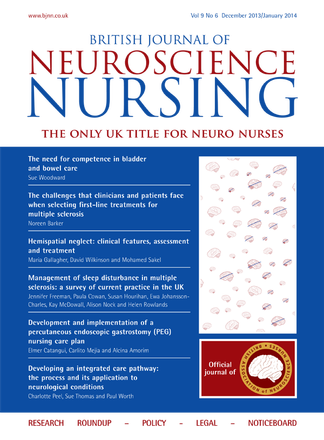 NB: This subscription also includes access to content on the British Journal of Neuroscience Nursing website, www.bjnn.co.uk. Subscribers will be emailed login details for their account within three working days of the subscription being taken out. Be the first person to tell us what you think about British Journal of Neuroscience Nursing and you'll save £2.50 on your next purchase!